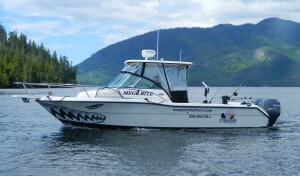 Our Fishing Vessel, Megabite, is a 2470 Pursuit walk-around with a spacious cabin and open deck for notable comfort. Designed for a smooth quiet ride and equipped with exceptional electronics (Radar, VHF, Radio, GPS, Sounder) our vessel is ready for your next fishing adventure! Tidal fishing licence with salmon stamp (must have day before charter) Available online: see policy page. Please contact us 1-250-725-3184 if you require any further information!